Due to the current political climate in the US and the strong demand for fossil-fuel marine propulsion systems, Electric & Hybrid Marine World Expo Florida will not take place in 2018. However, the global event - Electric & Hybrid Marine World Expo that takes place every June in Amsterdam and has done so since 2014 - has never been bigger, more needed, or more in demand. With over 130 exhibitors, some 3,000 attendees from all over the world, and a Conference that attracts almost 300 participants, you can still very much learn how to lower emissions and significantly reduce fuel costs as well as improve NVH at the global Amsterdam event. Click here to transfer to the the global show web site. The Electric and Hybrid Marine World Expo Florida Conference and Exhibition, to be held in Fort Lauderdale, Florida, is dedicated solely to showcasing the very latest and next-generation electric and hybrid marine propulsion technologies. With exhibits and conference speakers from all over the world, the The Electric and Hybrid Marine World Expo Florida Conference and Exhibition is exclusively for people interested in green-marine propulsion. Electric and hybrid propulsion systems are quieter or even silent, meaning a smoother propulsion experience. And with no gasoline or diesel engine, pure-electric craft have little or no vibration too. There are other advantages including lower emissions and saving fuel cost, but also the convenience of marina- or harbor-side charging. And increased electrification means you can run more auxiliary systems too. The The Electric and Hybrid Marine World Expo Florida Conference and Exhibition will discuss and showcase repowering solutions and systems integrators and service agents. Alongside the exclusive, free-to-attend conference with almost 30 expert speakers, over 50 exhibits will showcase a handful of the latest electric and hybrid boats as well numerous propulsion systems and the components that go into creating a green-marine propulsion system. If you are interested in learning more about repowering solutions or the components that create electric and hybrid systems, then the Electric & Hybrid Marine World Expo Florida Conference and Exhibition is the place to be. Entrance to the event is free. 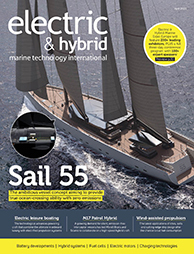 The Electric and Hybrid Marine World Expo Florida Conference and Exhibition is organised by the publisher of Electric & Hybrid Marine Technology International, the world’s only publication dedicated to these emerging electric and hybrid propulsion technologies. In effect, this world expo will bring the pages of the magazine to life (click here to read the latest issue). The Electric and Hybrid Marine World Expo Florida Conference and Exhibition is organised by UKI Media & Events, the world's premier international trade show organiser and magazine publisher operating in the maritime, aviation, automotive and transportation sectors. It is an international organiser of almost 30 industry-leading exhibitions, working globally in Hong Kong, Detroit, Los Angeles, Brussels, Stuttgart, Paris, Geneva and Brasilia, and attracts over 3,000 exhibiting companies and over 50,000 visitors to its events every year. Click here to discover more.